In my last posting on street photography, I talked about photographing the effects of the recession. This one will focus on shooting interesting and unusual moments that one can catch on camera: they’re usually called candids. The unusual is something that you’re taught to capture and search for in photojournalism. The streets provide lots of opportunities to do such things. 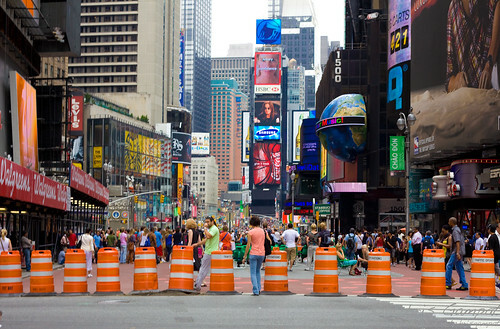 Note: The following posting primarily uses Times Square as an example of the unusual. Those of you that have visited New York City know that there are prime examples of the unusual all over the place. Every town and city has these though, you just need to look for it and frame it as such. Candids and the unusual aren’t very hard to find in most cases, it just requires paying lots of attention to your environment. For example, the above shot was taken at the Port Authority Mall/Shopping Center. 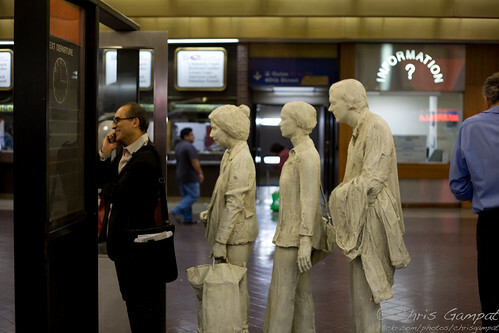 The statues are always there and the entire thing is actually artwork paying homage to all the people that have stood in line waiting for trains, busses, etc. It was very weird to see that man casually just standing there. No one does that unless they’re usually a tourist of some sort looking to take a picture for their family. This man was doing business on his phone though. Strangely enough, so was the man at the right end of the photo. I was out with my friends while I captured this: none of which even cared to notice this until they looked at the snapshot. A general tip for doing something like this: look at the entire world as if you’re looking through the viewfinder of your camera. We see unusual things all the time, we just don’t always have our cameras on us. If we do, it’s sometimes our cameraphone. 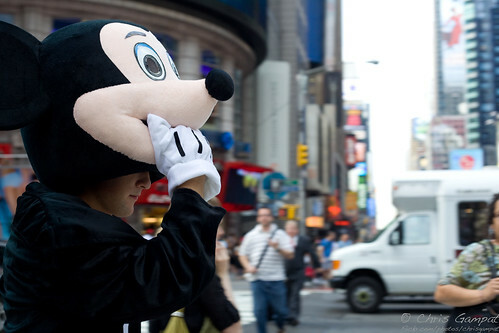 People go around dressed like characters all the time just to make some money. However, while casually strolling by you can always take a photo for yourself. 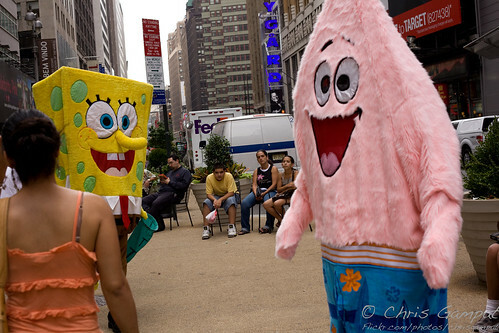 By the looks on the face of Spongebob and Patrick, they didn’t seem to mind too much. These unusual happenings are things that you don’t see often and can be submitted to your local newspaper. If you put them online with an Attributive Creative Commons License like I do, then your pictures will spread quickly. Just make sure you tag it correctly so that it appears in search engines. Your name gets around fast that way, too. The pictures of the plush characters we taken not too far away from this spot: it’s been coined as “Citizen Lane.” Basically, it’s a part of Times Square that has been blocked off for people to sit down and relax. It has faced opposition and praises. Because of the fact that it’s still so new, it’s unusual. This is where characters can sometimes appear. Granted, there is no real point of focus on this picture except that it’s just a landscape. However, to New Yorkers and even tourists, they will see this as unusual because of the fact that this once again is new. 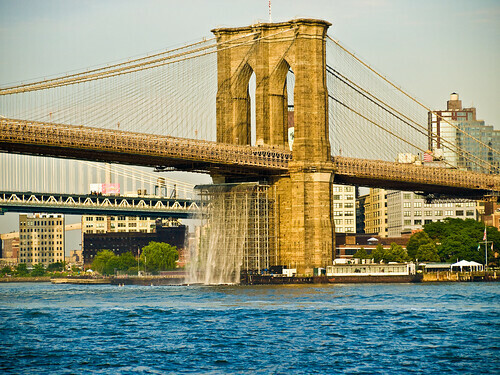 The same thing concept applies to last years waterfalls under the Brooklyn Bridge, as shown above. Like the waterfalls, this unusual moment in time may be gone soon: so it makes sense to get it while you can. What have you captured around you that’s unusual? Ahh.. I can almost hear and feel NY from these photos.